RinaHey, we're going to have a "nabe"　party this Sunday at Tominaga's home, Ryuichi are you free that day? RyuichiFortunately I'm free that day. A "nabe" party sounds great. I would love to go. RinaGreat. There will probably be 6 people. What kind of "nabe" shall we have? RyuichiThe standard "kimchi nabe"? "Mizutaki", " miso nabe", "chanko nabe", "seafood nabe", there are many choices. RinaRecently, there are also types like "soymilk nabe" and "tomato nabe". There are so many tastes of nabe, we really never grow tired of it. RyuichiI agree. I wouldn't mind if I had "nabe" every day during winter. Vegetables and meat are included, you can get carbohydrates from the udon and rice porridge, and you can get all the nutrition from one dish, so it's a perfect nutritional food, isn't it? RinaHow shall we get all the ingredients? Why don't we all bring something like a potluck and make a "yami nabe"? Ryuichi"Yami nabe" is too risky so lets not do that. I had a bad experience when I did it once with my friends and there was something unbelievable inside it. I was traumatized by it. RyuichiOne idiot was being silly and put in a "manju". Of course, the "manju" sucked up the soup and got all squelchy, the red bean became mixed up with the soup and turned it sweet. It was a disaster. RinaWow.. that must have been terrible. RyuichiThat's why we should all go to the supermarket and buy the ingredients together. RinaYes, let's do that. I don't want to eat "nabe" with a "manju" inside it. RyuichiWe should buy some Japanese sake too. RinaJapanese sake sounds good. "Hot sake" would warm us up even more. RyuichiHot "nabe" and delicious Japanese sake sounds perfect. I'm grateful for being born in Japan from the bottom of my heart. 日本人に愛される「鍋」って何？　What is "Nabe" beloved by Japanese? 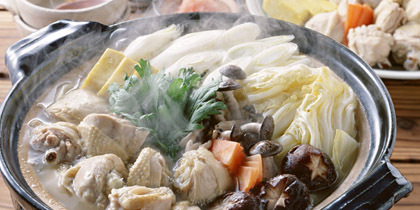 "鍋（Nabe）" is a hot pot cuisine with a conglomerate of ingredients cooked together in a hot pot. Generally, a number of people will eat together from a single pot. A wide range of ingredients can be used, with one main ingredient usually boiled together with vegetables and tofu. The ingredients are cut into bite-sized pieces for an enjoyable meal. Except for special cases, an earthen pot is almost always used for hot pot cuisine. A portable burner is placed on the table for the pot to sit on, and the food is generally boiled on the spot while everyone eats, periodically adding new ingredients. Hot pot cuisine is most often consumed in the winter months to keep warm. A "nabe" (pot) dish where each person brings their own ingredient, and the dish is cooked while not knowing what is inside. It is called "闇 (＝darkness) 鍋" from the fact that it is usually cooked in a dark place to keep what is being cooked a secret. It is popular as an amusement to enjoy the thrill.